This share is not technically a “Snippet,” at least not in the way I’ve been defining it. For clarification, the snippets I’ve shared thus far have been notes to myself, mostly recording the plot elements I needed to remember. There are some nice phrases, but not much actual attempts at writing. As I’m in charge of my own rules, I share this panel of finished art. I’m allowing it because no one has seen it before. It’s from the 13th Installment of The Story of Jasmine, which was not published. I love this particular page design. The previous two pages in this recap installment were both designed as two column pages with illustrations at the top and introduced the major players, two to a page. The design of the entire 13th “Story of Jasmine” Installment was symmetrical. I felt choosing this type of unifying layout would aid readers who first encounter the story. To more easily grasp a sense of the plot, the text introducing the characters together with their portraits, provide a stable visual foundation. But, by far, the third page, which mimics a cross, is visually satisfying to me. The text within the blue central panel states the essential purpose and objective for these characters to unite as companions of Jasmine. Both conceptually and visually, the central square unites the elements of the story and the page. 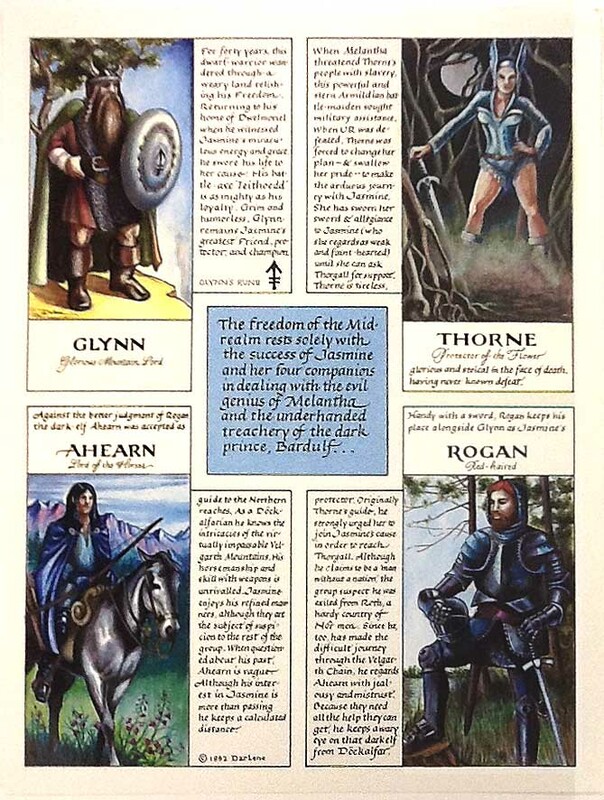 I like how the landscapes indicate something about each character and I’m especially fond of Ahearn’s illustration. But I do remember struggling with Thorne’s miniature painting. This panel was created before the days of computers. Today, using software like Photoshop, editing an image is no big deal. However, everything drawn and written on the above panel — all images and calligraphy — were created directly on the illustration board, leaving no room for mistakes. At that time, I had to be careful because the production camera picked up any attempts at corrective measures, such as in the case of changing misspellings. I believe the illustration board was at a size, close to 100% reproduction size. By the way, the text from yesterday’s share turned out to be from this panel. Should any other text that belongs to this page be found, I shall endeavor to point it out. This entry was posted in Calligraphy As Art, Design Tips, Jasmine & Role Playing Games, The Creative Process and tagged 13th installment, Ahearn, Cross, Glynn, graphic illustration, page layout, Rogan, symmetrical pages, symmetry, Thorne on February 7, 2018 by Darlene.